My house consists of two big people and one tiny person, so sometimes roasting an entire chicken just doesn't make sense. Unless, of course, you want to make chicken salad with the leftovers or just eat the whole damn chicken because you're trying to gain weight. 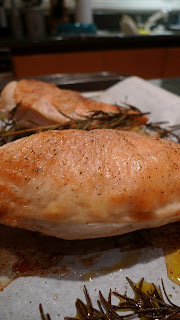 Last night, I tried out a super simple method of roasting two chicken breasts. Skin-on, bone-in, baking sheet, olive oil, lots of salt and pepper, rosemary and garlic cloves. 350 degrees, 35 minutes. The rosemary got crispy and the garlic caramelized. The skin was crunchy and the chicken was juicy. It was the perfect amount, and I saved room in my tummy for dessert! I don't always do that. Yes I do. This looks amazing! Looks so much better than just a plain roasted chicken breast!! shouldn't have looked at this just now...it's dinner time and that looks SO delicious. I'm eating leftovers, bah humbug. I'll have to try this! There's only two of us in my house too, so we always have way too many leftovers.